Whether you’re trying to get to class, or want to explore off-campus, you’ll be able to choose from some convenient forms of transportation. Aside from walking along our beautiful paths located throughout the Coral Gables campus, you can hop on a bike and easily get to your destination; you’ll find convenient bike racks all over campus along with free air stations and bike friendly pathways. Locks are also free upon registration with UM Police. For more information, please visit UBIKE. 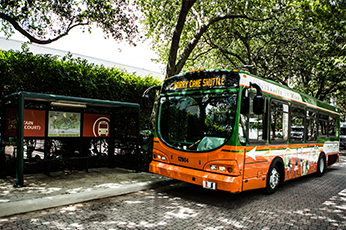 The Hurry 'Cane Shuttle, a free university shuttle service, runs every 8-15 minutes and stops at convenient locations across the Coral Gables campus. Shuttle service is provided to the Rosenstiel campus on Key Biscayne as well as nearby off-campus shopping, entertainment, restaurant, and grocery store locations. The Hurry 'Cane Shuttle accommodates the transportation needs of first-year residents since they are not permitted to have a car on campus. If you would like to venture further off campus, we have ZIPCARS available for rent. You can also utilize the public transit through the Miami-Dade Metrorail and Metrobus services, at a discounted rate. There is even a Metrorail station conveniently located right next to campus. To utilize the discounted rates, please visit the Information Desk located at the University Center or call 305-284-2318. Non-freshmen Resident Students and Commuter Students who have a car are eligible to purchase a parking permit in one of the available parking zones on campus. To learn more, visit the Parking and Transportation website.